Black diamonds have been around for centuries. In fact, a 350-carat black diamond was on display at the 1851 World’s Fair, where it was greatly admired for its unique beauty. However, black diamonds were rarely used in jewelry at this time because they were considered far too difficult to cut and polish. 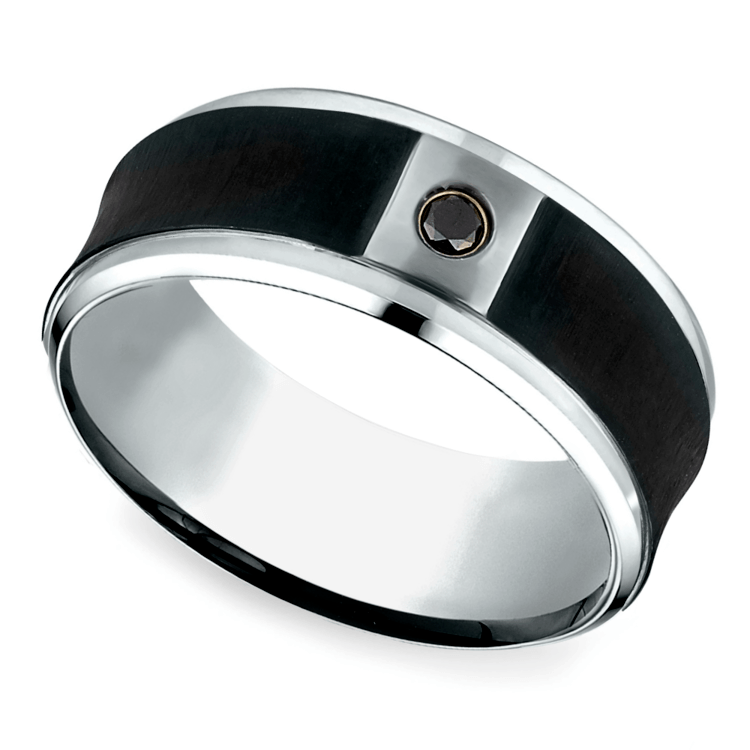 Fortunately, advances in technology have made it possible for jewelers to now incorporate black diamonds into unique men’s diamond wedding rings. 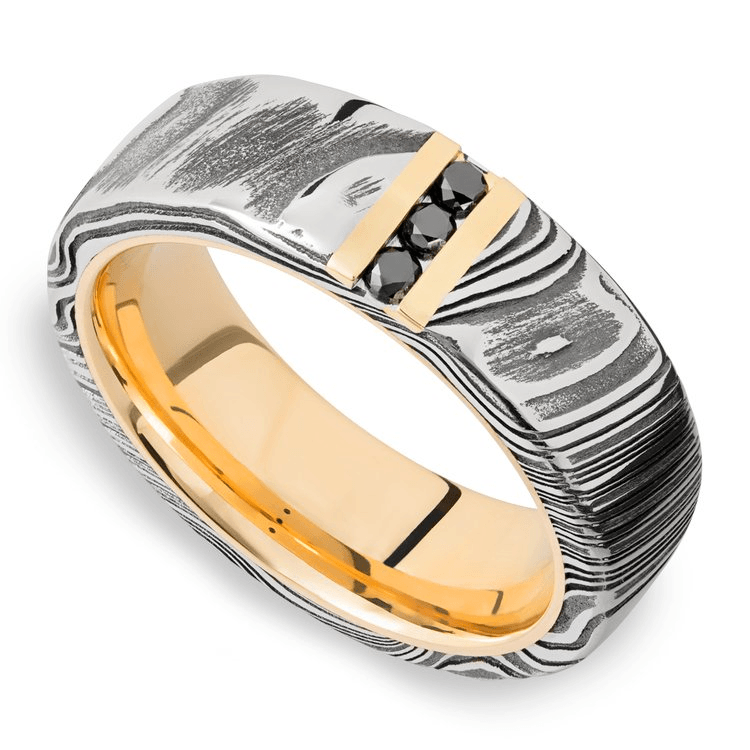 Black diamonds contrast beautifully with silver metals, which is why this design is so stunning. The black diamonds add character to this silver ring, and because they are bezel set, they will not snag on clothing or come loose. This design is anything but subtle! 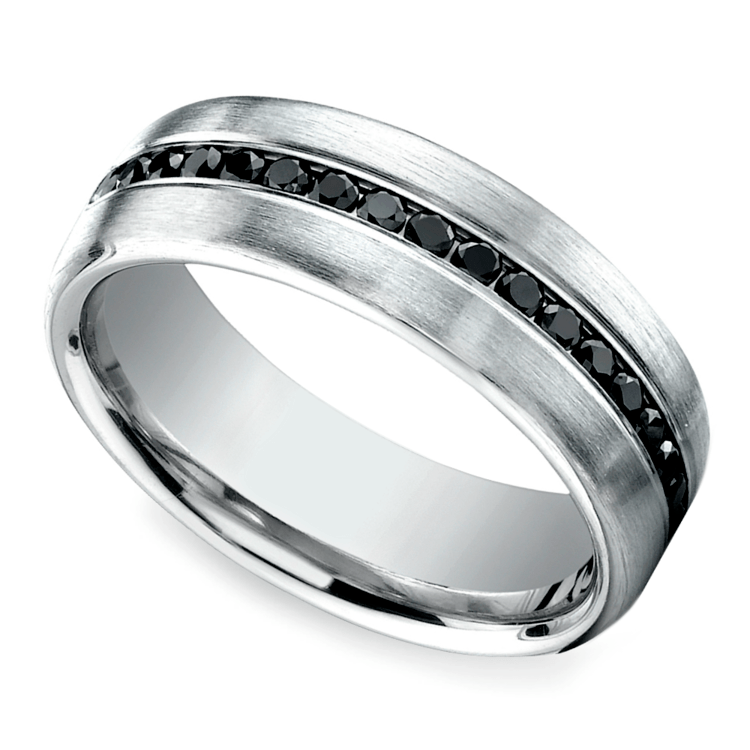 Twenty round black diamonds are wrapped around the entire length of the wedding band in a channel setting, which keeps the diamonds secure and prevents them from snagging on clothing. Together, the black diamonds and brushed white gold create a modern look that is perfect for sleek and sophisticated men who aren’t afraid to be noticed. Black diamonds look even more masculine when paired with a black metal such as cobalt. The single black diamond in the center of this design adds an unexpected sparkle to an otherwise simple setting. The black-on-black combination is cool and edgy, so this is a great choice for men who love to take risks and set trends. From the textured carbon inlay to the milgraining on the edges of the band, the detailing on this ring will take your breath away. Even though there is a lot of detailing, the ring still manages to look elegantly understated. The silver and black color scheme is stylish and chic, and the single black diamond in the center is the perfect finishing touch on this incredible design. Some men are drawn to the color black because of its association with masculinity. 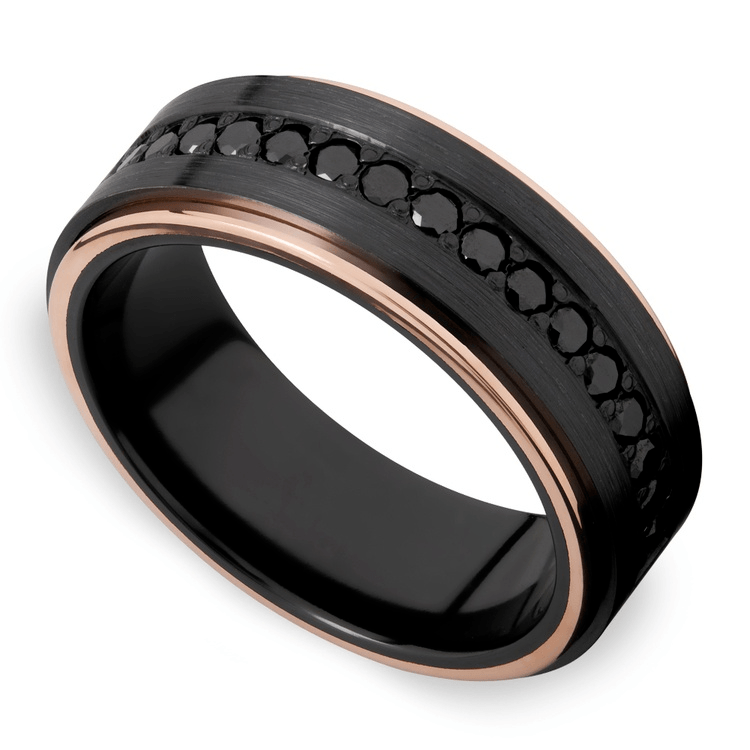 Men like this will feel an instant attraction to this unconventional black diamond wedding band. 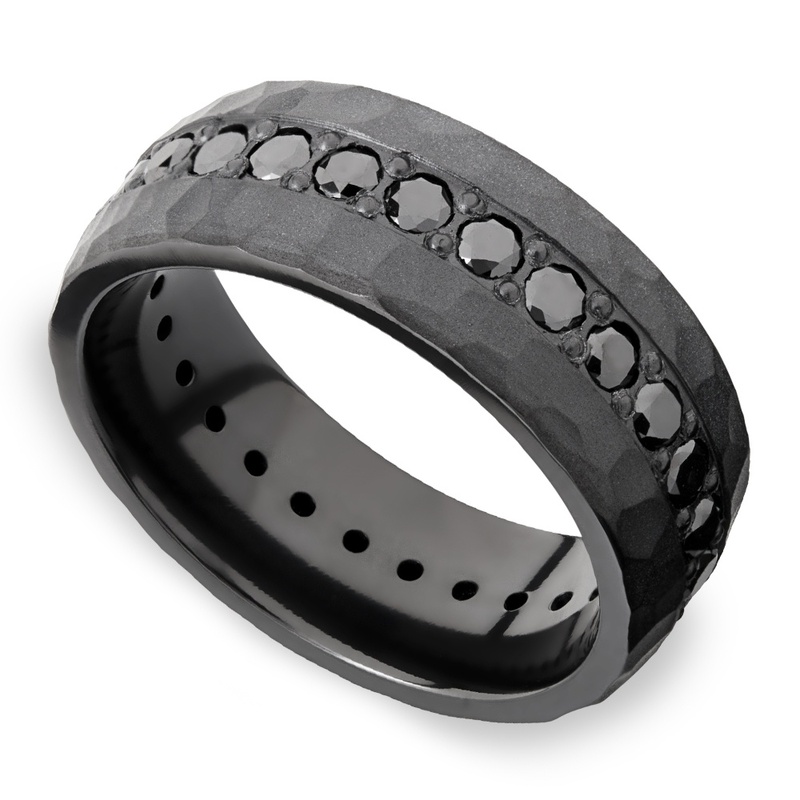 More than forty black diamonds circle around this wedding band, which is made out of textured black zirconium. 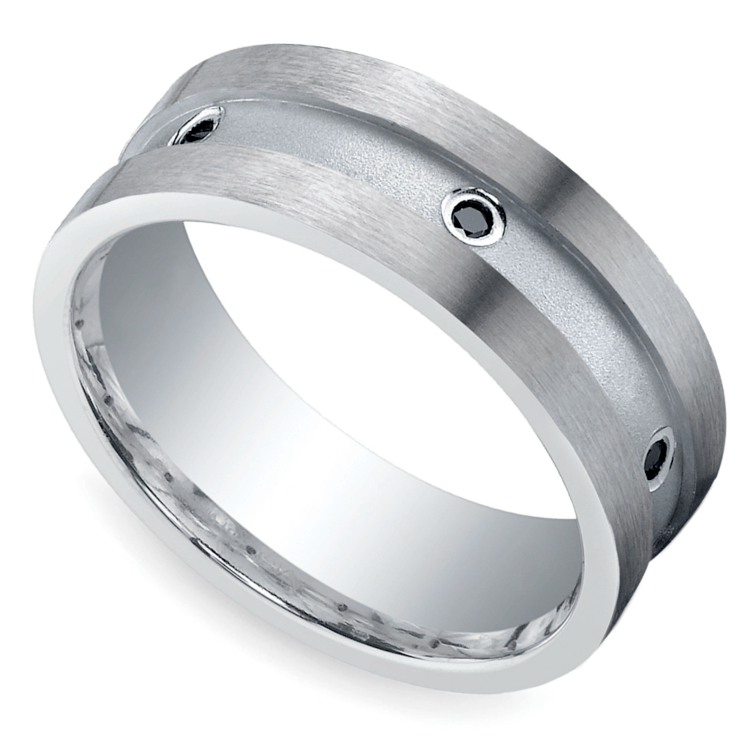 This fashion-forward ring is ideal for confident men who love turning heads and starting conversations. A rose gold border adds a surprising and alluring pop of color to an otherwise monochrome wedding band. Rose gold is often associated with romance and femininity, so it contrasts beautifully with the masculine black zirconium and row of sparkling black diamonds. This ring is perfect for men who embrace both sides of their personalities: the manly and tough side along with the soft and sensitive side. 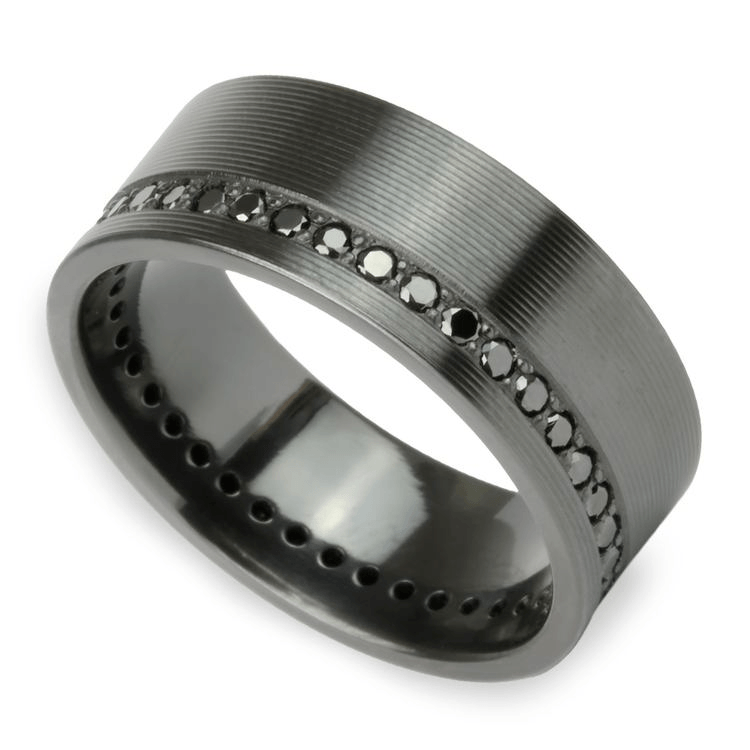 Men who want an unusual and one-of-a-kind ring should look no further than this Damascus band with black diamonds. 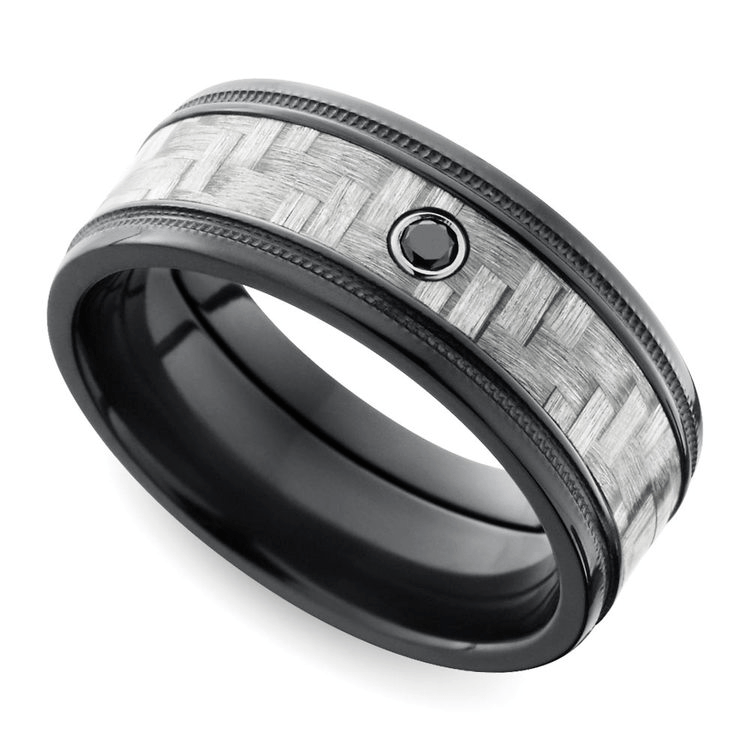 The wood grain Damascus creates a unique and quirky textured design around the band. But, the best part of this ring is the row of small black diamonds set in yellow gold in the center of the setting. These shiny diamonds elevate the look of the ring and instantly make it look more high-end and luxurious. There’s no need to settle for a plain gold or platinum wedding band when there are so many men’s diamond wedding rings to choose from. Step outside of your comfort zone with a black diamond wedding band that will make a bold statement about your personal style!